Homocysteine is made in the body from another amino acid, methionine. We take in this amino acid everyday from meat, cheese, and other proteins. No matter what sort of toxic food you may eat, poisonous air you breath, or contaminated water you may drink, you will have a hard time finding in your environment as mean a molecule as homocysteine. You have about one chance in 50 of being poisoned by your own homocysteine. When you eat a piece of fish containing methionine, it’s incorporated into your bloodstream and into your cells. A methyl Group is taken away from the methionine, leaving you with homocysteine. If the body adds a different methyl group back into homocysteine, you end up with an important comical called S-adenosyl methionine (Same). As levels of Same increase, another important chemical, glutathione, arises. Glutathione, an anti-aging antioxidant and detoxifying agent. Low glutathione level is also linked to increased risk of death from many causes. Without available methyl groups, you have elevated homocysteine. Methyl groups are: Folate, Vitamin B6, Vitamin B12, Vitamin B2, magnesium and zinc. They are dispensed by methyl donors such as SAMe and TMG. Same is not the best to supplement with as it is very expensive, and in lowering your homocysteine, naturally increases SAMe levels. Instead, TMG (trimethylglycine or bataine) is the single best methyl donor discovered so far and if found to prevent DNA damage. James Braly, M.D. & Patrick Holford, "The H Factor Solution"
Lowering homocysteine can be managed with nutrition. See how Cellfood DNA/RNA is over 90 times more effective than any competitor in lowering homocysteine and in one convenient bottle, saving the need for a counter of supplements. The time to take care of homocysteine is now. No prescription drug as been discovered that lowers your homocysteine, which is could be why the medical profession as been slow to look at homocysteine. The most important and easiest treatment is taking dietary supplements of Vitamin B12, Vitamin B6, folic acid and TMG (betaine), in addition to eating a balanced diet including fruits and green leafy vegetables. (1,7) While there are suggested daily amounts of supplements, the only reliable way to know if a patient is taking the right amounts to control a high serum homocysteine level is by having a blood test for homocysteine. Boushey CJ, Beresford SA, Omenn GS, and others. A quantitative assessment of plasma homocysteine as a risk factor for vascular disease: Probable benefits of increasing folic acid intakes. JAMA. October 4, 1995; volume 274, number 13, pages 1049-57. Remacha AF, Riera A, Cadafalch J and others. Vitamin B- 12 abnormalities in HIV-infected patients. EUROPEAN JOURNAL OF HAEMATOLOGY. July 1991; volume 47, number 1, pages 60-4. "Long=term betaine (TMG) supplementation of 10 patients, who had pyridoxine-resistant homocystinuria and gross hyperhomocysteienemia due to a deficiency of cystathionine β-synthasas activity, caused a substantial lowering of plasma homocysteine, which has now been maintained for periods of up to 13 years. We have found that prolonged betaine treatment, taken with concurrent vitamin B-6 and folic acid therapy, maintained its initial promise of lowering plasma homocysteine concentrations substantially in all patients." Nucleic acids: A proprietary blend of DNA and RNA bases. Methyl Groups & especially TMG: (trimethylglycine or betaine) A strong methyl group donator and helps to prevent DNA mutations and strand breaks. ATP: (adenosine triphoshpate) Has been shown to improve function of the heart and lung, relieve nerve pain, reduce the growth of tumors, protect tissues from radiation injury, improved shock survival, and boost athletic performance and muscle funtion. L-Lysine, & L-Proline: Recent research has shown this combination to be able to help prevent the growth of cancerous tumors. The combination of all these features gives you the most potent method ever for restoring DNA and RNA short of intravenous injection. Laser Enhancement Technology: Laser Enhancement Technology reshapes nutrient molecules. Result: about 99 % can be assimilated by the cells. Nutrient molecules get distorted during food or supplementation processing. Result: only about 1% can be assimilated by the cells. Typically manufactured nutritional supplement is subjected to chemical extraction, purification, and drying steps. All of these processes can cause numerous random distortions of nutrient shape. Enzymes of the body are highly shape sensitive for the molecules they will accept or reject. When the body receives a nutrient in a wide range of random shapes, some will fit and many others will not. The nutrients that don't fit will either be excreted or broken down to relatively useless compounds. The net effect of resonant laser stimulation is to create small flat stretched molecules that most importantly are consistent in shape from molecule to molecule. Homogenizing the shape of the molecules greatly reduces the enzyme energy needed to bind the next molecule, which can greatly increase the efficiency of nutrient utilization. 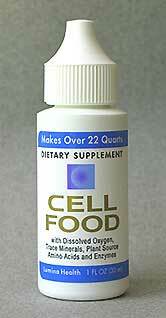 This allows the cells to make much more of the desired products from the same quantity of ingested nutrients. The laser technology used to enhance CELLFOOD DNA/RNA is the most powerful method of reshaping and homogenizing nutrients for absorption and assimilation ever developed. The combination of CELLFOOD and laser technologies is an unequaled combination for boosting amino acid and nucleic acid metabolism. Heart attacks by 80% Strokes by 82% Cancer by 33.3%, Diabetes by ?% depending on type, Alzheimer's by 50%. Improved mood, memory and mental clarity. Reduction in arthritic pain, migraines and firomyalgia. Raised glutathione level, slowing the aging process and detoxifying body. Reduction in risk of heart disease, strokes, cancer and Alzheimer’s disease. Heart Attacks: Reduce risk by 80% by lowering your homocysteine. Homocysteine injures arterial walls. Injured arterial cells more readily absorb LDL, or "bad" cholesterol. Homocysteine helps to promote smooth muscle cell growth in the artery, which narrows the vessel. As Homocysteine levels increase, you are at a higher risk for the formation of blood clots, which can lead to a heart attack or stroke. If you have cardiovascular disease, or stroke chances are your homocysteine is over 9 units. For every 5 units increase in homocysteine, the risk for heart disease went up 32% to 42%. Lowering homocysteine from 15 units to 6 units and maintaining that level my cut risk of death from heart attack by 75%! Homocysteine is about 40 times more predictive of heart attach than cholesterol. Many heart patients do not have high cholesterol. While drugs such as statins lower cholesterol, they don’t have as great effect on overall mortality, adding 18 months to life. Homocysteine lowers Nitric Oxide and interferes with magniesium but also damages the walls of the arteries, oxidizes the LDL cholesterol, and makes the blood stickier and more likely to clot abnormally. High homocysteine levels increases stroke risk by 82%. High blood pressure has been blamed for stroke, but two-thirds of stroke victims do not suffer from it. Blood pressure is controlled by the changing diameter of your arteries, and this can be made smaller by blockages, artery muscle spasms, and or stiffening arterial walls. Research on Magnesium deficiency showed blood vessels spasm, potentially reducing the diameter of an artery by 2/3rds. High homocysteine caused rapid depletion of magnesium from the smooth muscles that line the arteries, making them more likely to go into spasm, which can precipitate a heart attach or stroke. High homocysteine and faulty methylation cause abnormal cell growth. Oxidation is one of the primary ways DNA becomes damaged. High homocysteine and associated abnormal methylation is another. DNA needs to be repaired constantly. Methylation controls both the synthesis and the repair of DNA putting homocysteine, and key nutrients vitamin B12, B6, B2, folate, zinc, magnesium and TMG in the middle of the whole cancer process. Dr. L.L. Wu and colleagues at the University of Utah’s Health Science Center found that when other tumor markers went up, homocysteine went up, and when markers went down, so did homocysteine. Homocysteine may be a very useful indicator of the existence of cancer as well as success or failure of cancer therapies. "We found that elevated homocysteine in the blood may be another biomarker for increased risk of AMD (age-related macular degeneration)," said lead author Johanna M. Seddon, MD, director of epidemiology at the Massachusetts Eye and Ear Infirmary. Remacha AF, Riera A, Cadafalch J and others. Vitamin B- 12 abnormalities in HIV-infected patients. EUROPEAN JOURNAL OF HAEMATOLOGY. July 1991; volume 47, number 1, pages 60-4. Some of the most brilliant people such as Former President Ronald Reagan had Alzheimer’s disease. An article I the Journal of American Medicine Association showed that poor people in Nigeria are far less likely to develop Alzheimer’s than their relatives in Indianapolis, confirming that Alzheimer’s is not genetic but caused by something in North American lifestyle or environment. Very high plasma homocysteine levels are characteristic of homocystinuria, a rare autosomal recessive disease accompanied by the early onset of generalized osteoporosis. We therefore hypothesized that mildly elevated homocysteine levels might be related to age-related osteoporotic fractures. New England Journal of Medicine volume 350:2033-204, May 13,2004, number 20. Throughout life, mean total homeocysteine increases by between 3µmol/litre and 5µmol/litre. At age of 40 to 42, mean values are about 11µmol/litre and 9µmol/litre in men and women, respectively. The higher total homeocysteine concentrations seen in the elderly may be caused by many factors such as malabsorption owing to prevalent atrophic gastritis or insufficient nutritional supply of vitamins, lower nutritional intake, a slow-down of the metabolism, reduced kidney function and other physiological, age-related changes. Moreover, many drugs interact either by reducing the absorption of cofactors, or by increasing the catabolism of the vitamins. Certain diseases also influence the homeocysteine metabolism. Smoking, high alcohol intake and coffee consumption also interact by increasing the catabolism of vitamins or reducing the absorption of them. Lack of exercise, obesity and stress contribute also.